Today we have another partnered website and it is our longtime affiliate, Zelda Temple. Their site offers the regular flow of Zelda news, their own Community Forum, their own Zelda Wiki, and plenty of Zelda game related content. However, they occasionally release more exclusive work, such as this article touching on whether or not Zelda is Advancing Too Quickly. You can now see Zelda Temple listed along the sidebar under Partnered Websites. Additionally their RSS feed has been tossed into the Partners RSS feed, so you can see all their latest updates on the sidebar as well. 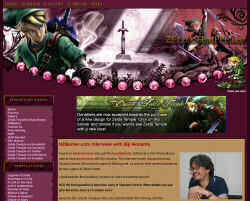 On occasion you will see some of their exclusive material featured right here at Zelda Dungeon. Welcome aboard Zelda Temple and we look forward to featuring some of your exclusive work!